If you follow Phule and Ambedkar’s vision, it is clear that the top-down approach of Indian leftists and liberals, who consider caste merely a part of culture and not a fundamental base, won’t work. ThePrint is publishing articles on Dalit issues as part of Dalit History Month. 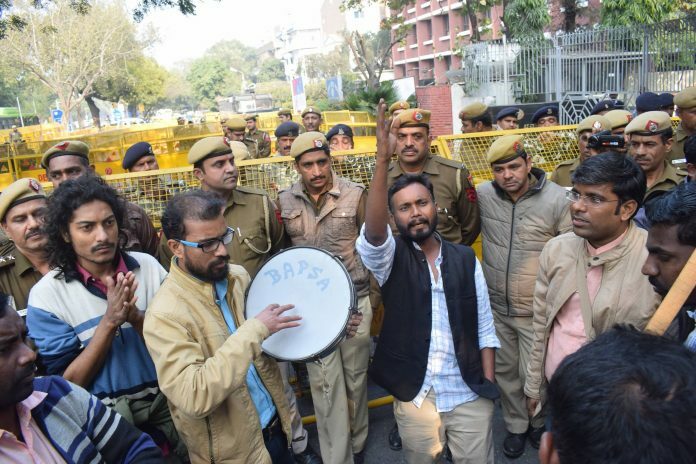 The recent protests by Dalits against the Supreme Court judgment on the Scheduled Castes & Scheduled Tribes (Prevention of Atrocities) Act, 1989, has once again started a debate around Bahujan unity. Many believe the amendment will weaken a vital component of the Act and leave Dalits defenceless. Interestingly, many organisations representing the other backward classes (OBCs) also supported the protests. The popular discourse on Bahujan unity revolves around the unity of the SCs, STs, OBCs and religious minorities for political power. At its heart lies the socio-cultural and, more importantly, economic reorganisation of downtrodden castes and communities. It indeed stems from Phule’s idea of ‘Bali Rajya’ — a golden age ruled by a Shudra king. Phule equates Bali with a lower-caste king and kingdom, and contrasts it with the caste apartheid against Shudras and Ati-shudras in the Shetji-Bhatji i.e. Brahmin-Baniya-ruled system under Peshwa Raj. So, he posed Shudras and Ati-Shudras as indigenous against ‘foreign conquerors’ Aryan Bhat-Brhamins. In post-Independence electoral politics, Ambedkar attempted to reshape the unity of Shudras and Ati-Shudras in a more modern yet organic way. Taking lessons from the past, Ambedkar changed his electoral strategies and planned a third political party, the Republican Party of India, whose aim was to bring together the scheduled castes, scheduled tribes and other backward classes to form a political majority. This political strategy imagined the marginalised sections shifting from being a political minority to being a ruling oppressed majority. This political imagination manifested in the post-Ambedkar period through Kanshi Ram’s terminology, wherein the SC, ST, OBCs and other minorities were called Bahujans. From Phule to Ambedkar to Kanshi Ram to now, one can talk about the positive changes and developments that have taken place among the lower castes, especially in the realm of politics. However, it is difficult to contest the fact that the majority of India’s lower castes, tribes and religious minorities (Muslims) are still not a part of the modern socio-political, educational, economic, cultural, governmental and non-governmental institutions. This also has led us to believe that, even in present times, the ‘majority of the oppressed’, which goes beyond the primary structure of caste, will once again produce an imagined category to define the way for the oppressed. The Indian Communists and civil society organisations have repeatedly committed such mistakes and badly faltered. Categories such as feudalism and peasantry to understand the rural society, and capitalism, market, factory, workers and globalisation to analyse the urban social order, have often been at the centre of the analysis for Indian left and liberals. These are indeed borrowed categories, rooted in the Western European experience of their society and marketplace. However, when it comes to the caste-based Indian society, they do little help to unravel the actual power relationship and dynamics between various caste groups. For instance, former peasant communities — such as Maratha, Kamma, Jat, who were at the centre of the Communist and socialist movement in Maharashtra, Telangana and North India, respectively — became, after the peasant movement, the primary exploiters of Dalits. Interestingly, most of such peasant groups have acquired political impunity and social dominance by claiming to be Kshatriyas by gaining political power. This appears contradictory to the top-down approach of Indian Leftists and liberals, who still consider the Indian peasant groups as ‘potential revolutionaries’ and believe that caste is merely a part of culture and not a fundamental base. In this regard, American sociologist Barrington Moore’s 1967 work, Social Origins of Dictatorship and Democracy: Lord and Peasant in the Making of the Modern World, is important. He argued that division on the basis of caste ends the revolutionary potential of Indian peasant groups. In addition, terms like worker, proletariat, factory, revolution are again common words that the Indian Left and thinkers often use in their understanding of India’s urban society. However, more than 90 per cent of Indian workers are not part of the modern or even Marxist conception of factory and production; they work in unorganised enterprises and, therefore, larger clutches of the caste economy are mostly controlled by traditional traders and money-lender caste groups. Scholars Thorat, Attewell and Rizvi, in their 2009 study ‘Urban Labour Market Discrimination’, pointed out that in urban areas, Dalits work mainly in the unorganised sector; tanning, scavenging, sweeping, and cleaning jobs remain distinctively Dalit occupations in modern India. Thus, the idea of labour, both in urban and rural settings, is still majorly entrenched in the idea of caste. Ambedkar’s argument that “caste is not just a division of labour but division of labourers” still stands relevant and echoes in the new, modern India. It is in this context that Kanshi Ram’s vision of Bahujan, the unity of all lower castes, appeals to the imagined idea of Bahujan Samaj. In fact, there are many tangible signs to yet again think about Bahujan unity i.e. a ‘majority of the oppressed’ against the BJP-RSS government. The conversion of lower OBC groups to Buddhism in Maharashtra against the RSS’s ‘ghar wapsi’, the support of several OBC organisations to Ambedkarites during the Maharashtra bandh against the Bhima Koregaon violence, the recent mammoth protest march of farmers in Maharashtra, who are mostly lower castes, and the refusal of OBC organisations to support the anti-reservationist upper caste group’s counter call of Bharat bandh on 10 April, all point to the possibility of Bahujan unity. With the recent unity of Dalits and OBCs in the recent UP bypolls shaking the BJP’s equations in the state, such a model seems to be the only way to counter the BJP-RSS at the national level. In conclusion, such examples of unity further need to be cemented by the strong ideological and philosophical base already existing in Phule’s vision of ‘Bali Rajya’ and Ambedkar’s vision of ‘republicanism’. Rahul Sonpimple is a leader with the Dalit Bahujan student group, BAPSA. Read more from ThePrint’s Dalit History Month archives.